The brain is the foundational component of every single aspect of your life. It governs your thoughts, your cognitive functioning, your emotions, your memory, and your movement, tirelessly, every single second of every single day. Keeping the brain health is essential to your overall well-being and exercising ensures that your brain is optimized. Today, it is possible to live healthier and to live longer. Various components of the body – such as the heart, joints, and other organs – have the inept ability to outlive the brain. As a result, our overall lifespan may result in being longer than the span of the brain. As we age, disorders of the brain have the opportunity to develop. Examples include stroke, dementia, Parkinson’s, and Alzheimer’s disease. By maintaining and ensuring optimal brain health, we not only lower our risks for developing these disorders, but, we possess the ability to preserve our precious memories and provide a boost to our cognitive health. Our lifestyle has an immense impact on the health of our brains. While it is true that we are unable to control our genetics or the general aging process, we do possess control over the individual lifestyle choices that we make. These include the substances that we put into our body, our dietary choices, the amount of sleep that we get, our ability to cope with stressors, the medications that we take, the nutrients that we digest, the hobbies that we take part in, and the amount of exercise that we get. In order to ensure that the lifespan of the brain matches the lifespan of our bodies, we must make decisions regarding these factors, constantly. The brain is a three-pound wonder. It is capable of working 24 hours a day, every single day of the week. Even when you are at physical rest, the brain is still working. There is enough electricity inside of the brain to be able to power a light – all on its own. It contains 100 billion neurons, 500 trillion synapses, is able to move approximately 300 miles per hour, and is capable of experiencing in excess of 70,000 thoughts on a daily basis. It helps to create those thoughts. It drives the emotions that you experience and stores all of your memories. Additionally, it controls all of your movements. It is also capable of adapting to and responding to changes that you experience, and makes every attempt possible to compensate for the injuries, illnesses, and diseases that you suffer from throughout your lifetime. By keeping the brain healthy, you keep your body healthy. The brain has been found to age – like the rest of the body. According to numerous studies, the brain shrinks in size, slows down, and becomes more resilient to change. It also becomes highly susceptible to the process of oxidative stress. In turn, it becomes more vulnerable to certain diseases, such as dementia and Alzheimer’s disease. Aging brain complications include forgetfulness, confusion, and improper fluctuations of chemicals that are processed by the brain. The good news is, you do not have to suffer from these complications just because the body is aging. You have the ability to keep your brain young, fit, and functioning appropriately. In order to do that, you must exercise and train the brain for optimal brain health! Research has established that exercise aids in the reduction of developing brain disorders and losing cognitive functioning. This is because when we exercise, we are optimizing the blood flow throughout the body. 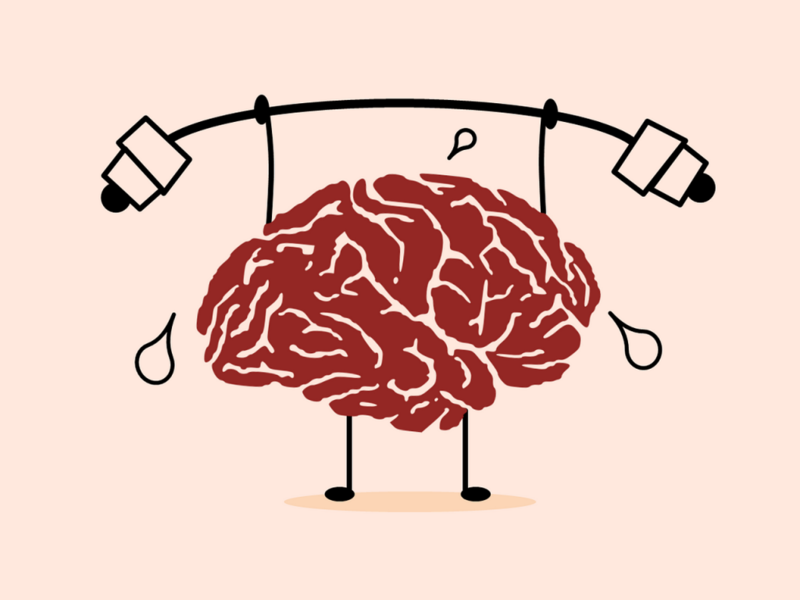 Exercises also aid in stimulating various types of chemical changes in the brain that aid in the process of learning, problem-solving skills, thinking, and mood fluctuations. Physical exercise also helps in reducing stress levels and optimizing sleep quality. When we sleep better and more, it optimizes the overall health of the body. Physical therapists, doctors, and other health specialists recommend using the 4-step exercise program in order to achieve optimal brain health. These include the components of aerobic exercise, strength training, flexibility activities, and balance enhancement techniques. This type of exercises should be done at least 5 days out of the week. It should involve a half hour of moderate-level intensity activities. Examples of ideal aerobic exercises include walking, hiking, swimming, biking, dancing, and similar movements. Strength training exercises should be done at least 2 days a week. You should perform 1 exercise for each of your muscle groups, with a total of up to 12 repetitions. Examples of ideal exercises include squats, curling the biceps, performing lunges, press-downs of the triceps, shoulder presses, planks, and similar activities. Exercises with an emphasis on flexibility should be done 3 to 5 days each week and for sessions that are 10-15 minutes in length. All stretches should be held for 30, 60, or 90 seconds each. When performing the exercises, you should stretch the muscles so that they go through a full range of movements. Examples of these include basic stretches, yoga, as well as Tai Chi. Balance enhancement techniques should be done at least 2-3 days a week. You should do sit to stand exercises such as walking backwards, walking sideways, walking heel to toe, standing on one leg, yoga, or Tai Chi. As you can see, there are many exercises that can be performed to optimize the health of your brain. If you need a little assistance, you should contact one of our physical therapists today. We offer brain training equipment, one-on-one sessions, and group sessions that will help keep your brain strong and healthy.